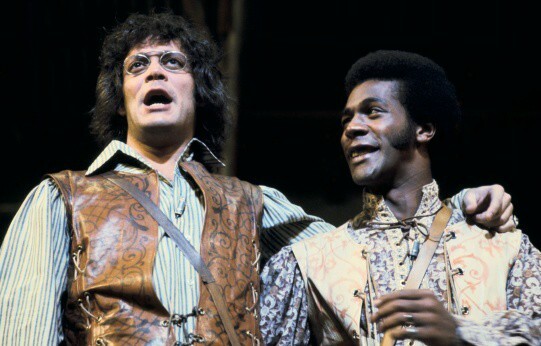 In December 1971, the musical version of Two Gentlemen of Verona took Broadway by storm after a summer tryout at the Delacorte in Central Park. In researching the show’s history, I dug up a lot of very cool facts. 2. It beat Grease for the 1972 Tony Award for Best Musical. Oh, AND it also beat Follies. Sometimes, that Best Musical category is darkhorsed like a bawse (just ask Avenue Q)! That Tony probably felt especially good in the hands of Galt MacDermot (see below), whose legendary musical Hair lost just three years prior. 5. Hair composer Galt MacDermot wrote the music. And, no wonder: The show sounds like a cross between Hair and Pippin, which came out a year later. This period seems like it was a real turning point for musical theater, with Broadway being forced to reckon with the fact that rock music can and should be a part of its legacy. Check out the Two Gentlemen of Verona Original Broadway Cast recording on Spotify by clicking below. If you’re not sure where to start, “Night Letter” (see the video above for the 2005 revival version) is a straight-up banger and “Summer, Summer”, the opening number is groovy AF. Fair warning, this album is gonna be your new jam!